Traffic vs job opportunities dilemma as American Dream Miami project for unincorporated northwest Miami-Dade gets approval. The complex would include a mall, theme park, 2,000 hotel rooms, a 16-story indoor ski slope, a 20-slide water park, a 14-screen 3-D movie theater, a performing arts center and more. Rendering of the American Dream Miami Complex, courtesy of American Dream. 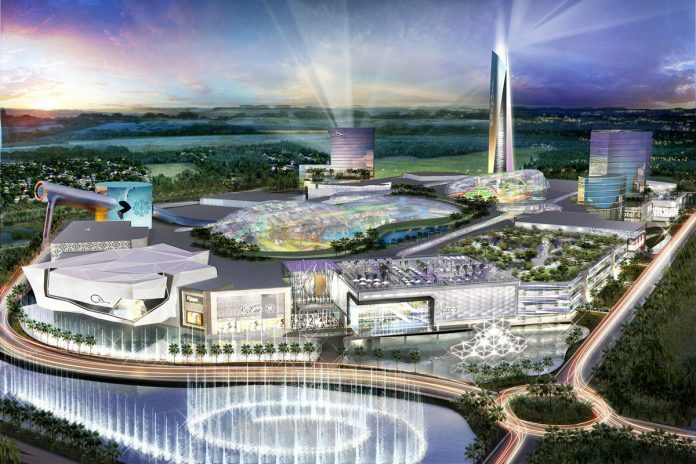 A crucial vote took place today for a gigantic $4 billion retail and entertainment complex near Miami and close to the Everglades that would become the largest mall in North America once completed. Miami-Dade County Commission approved the $4 billion project for American Dream Miami today. More than a mall, its developers say it would include theme-park attractions such as an indoor ski slope, submarine ride, water park, skating rink, retail shops and restaurants and 2,000 hotel rooms. American Dream Miami promotes itself as a local alternative to Disney World, and a shopping and entertainment destination spanning more than 6 million square feet. It will be located at the intersection of Interstate 75, Florida’s Turnpike Extension and Miami Gardens Drive. This mega center is anticipated to exceed 5 Million Square Feet of dynamic retail, entertainment and dining experiences much other renowned projects Mall of America, West Edmonton Mall, and American Dream NJ/NY. Mayor Carlos Gimenez touted the $4 billion retail theme park as a boon to the region’s economy as the nation’s biggest theme park-mall complex expects to employ about 14,000 people full-time. Canadian developer Triple Five estimates it would draw some 30 million visitors a year. Environmental advocates warn of runaway development in a sensitive area. Traffic, which is already a major problem in Miami, might become an even tougher gridlock with this new Miami-Dade’s large tourist attraction. That project already has residents of nearby Miami Lakes and Broward County worried about the effect a projected 70,000 daily vehicle trips to and from the mall could have on traffic. Although it’s close to the environmentally sensitive Everglades, most concerns have centered on traffic. Neighboring Broward County has threatened to sue if developers don’t take steps to ease traffic gridlock. Triple Five, the Canada-based developer of Minnesota’s Mall of America, is the same developer that wants to build the $4 billion American Dream Miami complex. Miami-Dade County approves American Dream Miami Complex. The Miami-Dade County Commissioners made a final ‘yes’ vote on the $4 billion American Dream Miami complex in Northwest Miami-Dade, at the intersection of the Florida Turnpike and I-75.